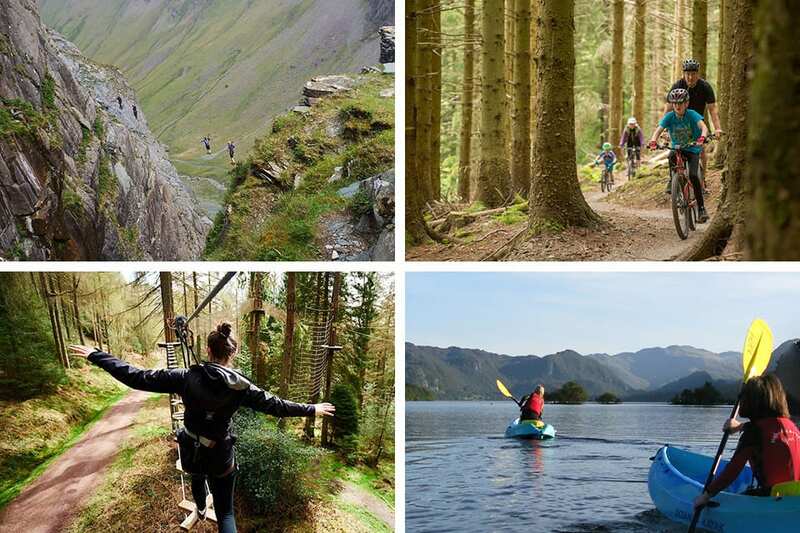 Clockwise from top left: (1) Via Ferrata Xtreme at Honistor, (2) Mountain biking in Whinlatter Forest, (3) Canoeing on Derwentwater with Nichol End Marine, (4) Tree top adventure with GoApe! at Whinlatter Forest. Keswick is rightly seen by many as the Adventure Capital of the Lake District. If you can do it outdoors, you can do it around Keswick! Here are some ideas of things to do in Keswick. Climbing walls, training, days out. Climbing and ice walls in centre of Keswick. Climbing, absailing, canoeing and days out. Regular scheduled services, various drop offs on lakeshore. For sailing, canoeing, kayaking hire & tuition. For Sailing, kayaking, canoeing and things watersport. Try the latest water sport storming the UK. Walking, red squirrels, cycling and mountain bikes routes, Osprey centre. Bike hire, MTB courses, repairs and servicing, e-bikes, and bike shop. High ropes in Whinlatter Forest. For slate sales, mine tours and via ferrata.